Looking for grow your own tips? These ones are between one and two thousand years old, passed on from the ancient Greeks, Romans and Persians. They were collated in 1306 by an Italian called Pietro Crescenzi in his book, the Ruralia Commoda. These tips have been translated into modern day English from Latin and Italian exclusively for Grow Like Grandad. If you’d like to know more about the background to this translation project see here. Fennel is sown in the month of December, January, February, and March [in ancient Italy, June is better in modern Britain], and can be transplanted at any time. It is hot and dry in the second degree. It has a diuretic virtue, as well as of reducing wind. Thanks to its subtle substance and for its qualities, when taken after eating it is good for acidic belches, which happen due to indigestion. Its seed, leaves, flowers and the external skin of the roots are suitable to be used as medicine. The seed is harvested at the beginning of autumn, and is stored for three years. Root skins are harvested at the beginning of spring, and are stored for half a year. Against the obstruction of the spleen and the liver, against strangury and dysuria, and against kidney stones caused by a cold cause, give the water of its decoction [boiling down]. Against the aforementioned things, fennel is also good when cooked and then eaten. This very water or wine also resolves stomach ache due to coldness or wind and comforts digestion. The same effect is given by the powder of its seed. Against eye inflammation and itching, put the juice of its roots in a copper pot, leaving it in the sun for fifteen days, and then put it in the eyes, like an eye-wash. Against eye itching, a certain remedy consists of blending optimum aloe with fennel juice, put it in a copper pot in the sun for fifteen days, and then in the eyes, like an eye-wash.
Oregano is hot and dry in the third degree [Dehydrating, Fluid Retaining] and it is also known by the name of Gonella. It consists of two varieties: that is, wild and domesticated. The wild variety, which has wider leaves, has a stronger effect. 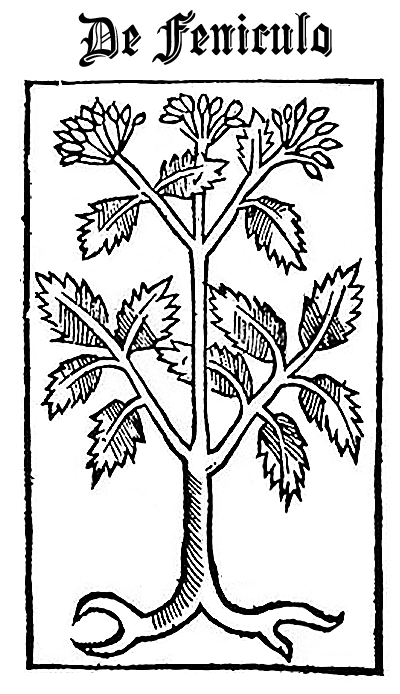 The domesticated variety has small leaves, that is, smaller than those of the wild one; it is the variety that is found in gardens, its effect is softer and it’s given in medicines. It is harvested at the time in which it has produced flowers, it is hung in shade and it dries out. 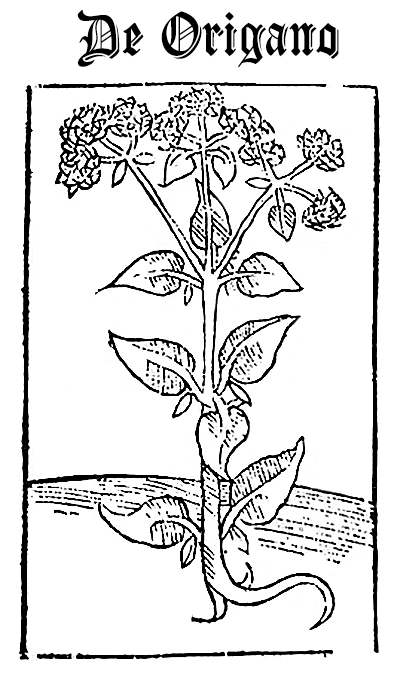 After throwing away the stems, its flowers and leaves must be put in medicines; it is storable for one year and it has the virtue of dissolving, consuming and attracting [being ‘hot and dry’]. Against the mucus of the head due to a cold, take its heated leaves with flowers and put them in a bag without any liquid, and put this bag on the head, keeping it held there, well covered with cloths, so that the head sweats. The wine in which it will be cooked, when gargled, consumes the moisture of the gums and of the throat. Also its powder consumes moisture when put on them. Against cold asthma, give the wine from its decoction [boiling down] and some dry figs. Alternatively, give its powder coated with honey, and give it with hot water. Again, the wine in which it will be cooked comforts digestion, and removes stomach ache and gut ache. Also, if bundles are made of the herb, and are cooked in wine, and are put on the kidneys, they sort strangury and dysuria. Sage is planted with other plants [a common companion with Brassicas] and young branches [?] in the month of October and November, and better in the month of March. Sage is hot in the first degree and dry in the second [opens Pores to reduce inflammation], and only its green and dry leaves are suitable to be used as medicine, and can be stored for one year. Sage is domesticated and wild. The wild type is called eupatorium. The domesticated type is more consuming and comforting, whereas the wild one is more diaphoretic [sweat inducing]. The wine in which sage will be cooked is effective against paralysis and epilepsy. When cooked in wine and smeared on the paralytic parts, it is very effective. And the fomentation [preparing a warm medical poultice] of the water of its decoction is good against strangury and dysuria, and cleanses the uterus. It is also conveniently added to flavours [cooking]. That concludes this translation of Latin and old Italian text from the Ruralia Commoda. 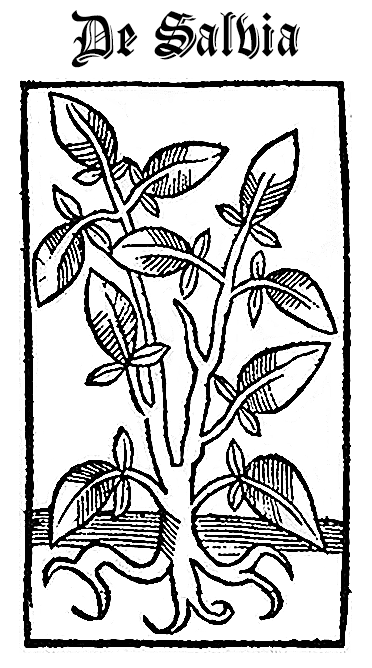 Stay tuned for the forthcoming herb and vegetable translations over the coming days and keep an eye on #MedievalGrowYourOwn on Twitter. 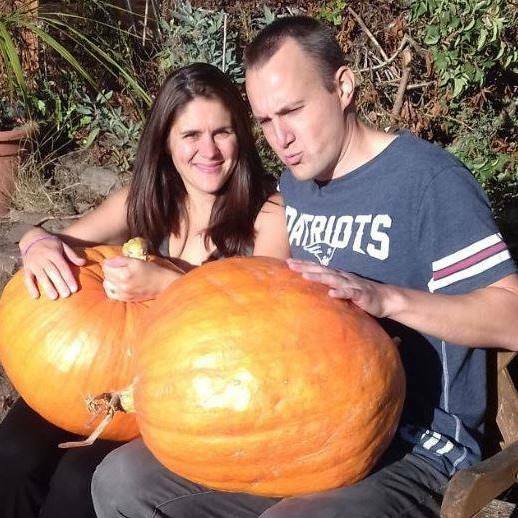 Matt Peskett is GrowLikeGrandad (if you want to know why read 'About the Editor). He has a 'heavy clay' allotment and is a member of the Dorking Allotment Holders Association (DAHA). Matt also has a medium sized 'sandy soil' hillside garden (Italian terrace designed) and enjoys photography - especially nature. Matt takes inspiration from gardens like Hidcote, Great Dixter and Sissinghurst and enjoys watching anything on TV with Monty Don in it.